Thanks for the lamp instructions. I lit it tonight and it works perfectly putting out a good light. The shade is the right size and looks great so yet another satisfied customer! From the moment I walked into Kaye and Dereks shop I was filled with confidence that my years long search for a new chimney would finally be over. Kaye's smile when I explained how the cat had knocked the lamp over and my exasperation at trying to find a new chimney immediately set me at ease. Nothing was too much trouble as she and Derek set about calling all their contacts abroad. Kaye asked me to leave the lamp with them and Derek would give it a bit of a cleanup as well. Oh, and what about a new shade to go with it. Kaye suggested pink, and my initial react was YUK !! How wrong was I. The touch ups that Derek performed was nothing short of amazing and with the new chimney and PINK shade, I now have the most beautiful piece of history. Which I must say, I now know more about because of Kaye and Derek's incredible knowledge. I would not hesitate to recommend Bristol and Bath. creating that warm glow that only these lamps can give. Delighted to see you are on line - a happy previous customer. Delighted with the lamp and it was lovely to meet you. 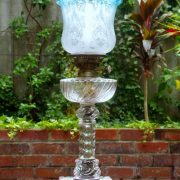 My Messenger Duplex Oil lamp with marble column and base purchased from you looks really lovely. Thank you so much, best regards. Thankyou for fixing up the 2 lamps so beautifully ( and so soon !). Anyway meanwhile thanks again I am delighted with the result – I can see how one could become addicted - I am sure I'll be back to you for another one some time - it’s a lot of fun to enjoy something with such history, beauty and continued function. After breaking the glass shade on an old oil lamp we own. We trudged around all the antique shops for many months to no avail and with what seemed to be no hope of ever replacing it. Luckily for me I came across Bristol and Bath Antique Oil Lamps on the internet and discovered they were local. I made an appointment with Kaye and was totally blown away at the range of stock they have – everything you can imagine to do with oil lamps, every colour, shade, wicks, parts, fragrant oils – you name it. Not only did I find exactly what I was looking for but it was a pleasurable experience dealing with Kaye who was so friendly and sent me away with heaps of helpful tips. The range is fantastic and I would highly recommend making this your first stop. Bristol and Bath shed new light on friendly old fashioned service!! Hi Kaye & Derek. 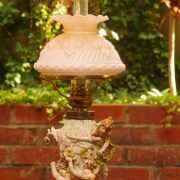 May I take this opportunity to thank you both for the professional service I received from you on the recent renovation to my old Oil Lamp. Absolutely delighted with the quality of detail and workmanship, it was amazing and brought out the original beauty of this prized possession that we purchased some 60 years ago. The transformation is something unique and one can only strongly recommend this service to all that are contemplating the renovation of their oil lamp of which they will admire and give hours of pleasure for many years to come. CONGRATULATIONS BRISTOL & BATH ANTIQUES. I strongly recommend them. Derek Williams Perth Western Australia. Thought I'd let you know that the lamps arrived safely today. They look fantastic. Also the postage refund has gone through.